This is the second of our posts previewing the budget for the coming 2015-16 fiscal year, which runs from July 1 to June 30, 2016. Our first post included a good overview of Metro’s budget. The presentation above takes a look at Metro’s spending on transit projects next year, which most notably includes the opening of the second phase of the Expo Line to Santa Monica and the Gold Line Foothill Extension to the Azusa/Glendora border. But there’s also the continued construction of three other rail projects (Crenshaw/LAX Line, Purple Line Extension Section 1, Regional Connector), the continued acquisition of new buses and light rail vehicles and smaller ongoing projects that are important to riders (i.e. the pedestrian tunnel under Lankershim connecting the NoHo Red Line and Orange Line stations. The third and fourth slides above are perhaps the most interesting. The half-cent sales tax increase for transportation approved by voters in 2008 (Measure R) is growing Metro’s construction program and expanding the Metro system. Meanwhile the forecasts show another important consideration — the agency’s need to maintain both the existing system and the new buses, rail lines and facilities over time. Bottom line: it’s a big system, it’s growing and keeping it running isn’t cheap. Please leave a comment if you have any questions about the language or any particular program and I’ll try to get an answer. Yes, and is the ultimate point of the article to try and be convincing enough that more taxes and higher fares are your usual solutions to this problem? It’s not a surprise Metro, because every single transit agency in the US has this problem. How about NONE OF THE ABOVE? Whatever happened to proper fiscal management? We asked that you look into fare gating to stop fare evaders way early on. You didn’t listen for over two decades. Only recently you realized that this was a big problem that was costing you billions in lost fare revenue and scrambled to fix the issue. Why? Because you are government, you don’t have to worry about fiscal responsibility. If it were any other company, Metro would’ve declared bankruptcy a long time ago. So at least you wised up that the honor system was a stupid idea. Took you 20 years to figure that one out. 1. End free parking. Land is scarce in LA today. Free parking for public transit must become paid parking. Car drivers will cause a stink about it, but too bad. If they want to ride Metro for cheap, the least they can do is start paying for parking at those Metro parking lots. You need to put your feet down and start thinking like a business, not a government agency. If they say they won’t ride Metro anymore and will just drive, fine. Stop catering to special interests who have no idea how finances work. Public transit isn’t for car drivers anyway. They want to sit in traffic jams because they don’t want to pony up parking fees, that’s their choice. More people will end up paying for relatively cheap parking at Metro stations anyway because even then it’s still cheaper than paying parking at DTLA. 2. Fare caps, fare caps, fare caps. This has been also discussed frequently. We don’t want a system that makes us “think ahead” which we get a better deal when the system can handle that automatically. It’s a simple fix that can be done immediately to the TAP system code. I don’t want to hear excuses that it can’t be done, there are problems with it under the current 7-day or 30-day pass system, just do it. You tap, tap, tap, hit the daily, weekly, monthly cap, it deducts no further. It’s simple, it’s easier, and far more friendlier to the users of the Metro system. 3. Expand the TAP card for use as a payment method to other businesses. There is a reason why countries like South Korea, Japan, Taiwan and Hong Kong does that. It brings in additional revenue stream to the transit operator by charging businesses that accept T-Money, Suica, Easy Card and Octopus Cards a small fraction of the charge for payments of goods and services. You need to start taking action on this now. There’s no reason why TAP should only be used to ride public transit. The cash stored on TAP is perfectly good for all transactions just like a Federal Reserve Note – “this note is legal tender for all debts, public and private”. What’s the difference between stored cash on TAP and an actual Federal Reserve Note? Absolutely nothing. Then why restrict yourself to being only good toward Metro rides? 3. Start renting out empty spaces at Metro stations for private businesses and collect rent. Why waste perfectly good space? It costs money to run and maintain stations too. What is going on there when it can be shared use with businesses? Hasn’t anyone working at Metro gone to cities where they have excellent services and shops at their stations? Why do you think they do that? It creates jobs. It promotes economic activity. It creates more revenue to the system. And goods and services sold also contribute to more sales taxes. Why haven’t you done this yet is a complete mystery to me when considering all the positive outcomes. 4. Ultimately, start introducing the concept of cheaply rated distance based fares. Who cares if some person living in Orange County complains that now he has to pay more to go to Downtown LA venues. That person is NOT AN LA COUNTY taxpayer. He does not live here, he pays no sales or property taxes to LA County, when he visits here, he is a visitor. If he chose to live in Orange County and wants to come to DTLA venues, he needs to pay his fair share. LA County residents who live and reside within LA County should not be subsidizing those who chose to live far away. They live far away from where they are going, pay more. People who live closer and jobs closer, pays less. It’s a concept that works. If someone raises a stink about why they have to pay more just because they have to travel far away, put your feet down and say “live closer where you work, or find a job closer to where you live.” This isn’t a socialist country where we expect public transit to remain cheap and everyone pays the same price whether you go from Santa Monica all the way to Montclair, or a relatively short distance from Wilshire/Western to 7th/Metro. We have some responses from Metro staff about your points. I hope this helps provide Metro’s point-of-view on these issues. FREE PARKING: Currently Metro does charge for preferred parking at certain stations — so not every parking spot is free. Metro is in the process this year of completing a comprehensive parking plan that will reevaluate parking strategies. This plan will consider the implications of implementing parking fees at Metro stations. We are also developing and implementing a parking ordinance that will help ensure that parking is being used by Metro transit patrons, and, if we implement parking fees, the ordinance will enforce those fees. FARE CAPS: In the U.S., many who have implemented fare capping have done it in conjunction with a “new product” as customer marketing is the major hurdle with fare capping, especially in traditional pass-based systems. However, with proper marketing the confusion with paying full-fare until your reach a threshold can be done. It’s worth noting that most studies assume that fare capping will result in a net loss to revenue, which is a concern for Metro and most transit agencies. EXPANDING TAP CARD USE: Because some transit benefits are subsidized, the stored-value (“cash stored on TAP”) purse is not the same as a Federal Reserve Note. The TAP system was originally designed with the ability to hold 2 separate card purses of stored-value, one for transit, and one for everything else. A pilot of this concept was tried in 2009 with a joint VISA/TAP Debit Card. The fees required to load the non-transit side were in-line with other Debit Cards, however, there was little consumer demand for a card with 2 separate purses. The reason that other governments/countries can operate these financial systems as one system is unique to the banking regulations of those countries, which are different than in the U.S. and California. RENTING EMPTY SPACES AT TRANSIT STATIONS: Metro does have a very robust Joint Development Program in which we partner with private entities to develop and provide both commercial and residential opportunities on Metro-owned properties, including station sites and other Metro-owned properties. Many of these developments provide substantial leasing revenues to Metro and in terms of other transit agencies throughout the country, Metro is a leader in this regard. Within certain stations like Union Station, Metro has been very successful in expanding and enhancing commercial retail opportunities, with several new leases just signed and more in negotiations. On a lesser scale we do receive rent and allow small concessioners to occupy space at some of our stations. Metro has studied opportunities for concessions at other stations, and the main challenges Metro faces in expanding these types of services center around: lack of space, lack of infrastructure (i.e. electricity) to support concessions, maintenance and security. In spite of these challenges, Metro is currently looking at opportunities to expand on the use of concessioner and retail vendors at our stations over the next couple of years and we hope to implement some these strategies to provide increased revenues and services while at the same time addressing potential maintenance and security issues. DISTANCE-BASED FARES: Distance-based fares are an equitable method for charging fares, especially because Los Angeles County covers a vast area. However, one of the goals and objectives for our new fare system was simplification. Even with the introduction of smart cards, the U.S. transit industry as a whole has trended toward making fare systems easier to understand and more universal with relatively few agencies using distance-based fares. The ease of use and administration of a flat fare outweighs the advantages offered by fare differentials. Metro is a huge system with the large majority (70%) of riders using the bus. In addition, the demographic profile of our riders are largely minority and low-income, and it is these riders that are transit-dependent that live in LA County that are of particular interest to us. The introduction of the 2-hour transfers included in the base fare was to help these riders and encourage the use of the growing transit network. OTOH, you also try to end the discuss there. What you haven’t asked is the next step: “Up to what point (fare price) will people continue to be for an easier flat rate system over an equitable distance base system” is the real question you haven’t asked, or trying to dodge and avoid. Realistically, people ultimately aren’t going to be for “ease of use” or let the excuse “it’s easier for Metro to implement” fly when fares keep going up constantly. Look at NYC; fares keep going up almost every year just like the Forever stamp and everytime it does it causes an uproar. Fares going up has nothing to do with inflation; look at Asia, most of their fare rates remain constant with no fare hike for decades. And each time it happens, more and more NYers are discussing implementation of distance based fares like the DC Metro or looking toward Asia, or incorporating a zonal system like London’s Underground. Let’s be realistic. You and I know that $1.75 today is not going to last. Within a few years, it will be $2.00 per ride, $2.50 per ride, $3.00…as with the case as other cities in the US that have chosen the flat rate route. There is a limit to how much people will take ease of use over price of transit. Flat rate fares is ultimately a disaster; all US cities are going to have to end up jacking up fares. And everytime they do, everyone is going to get upset. It’s easy and simple, but it also isn’t without it’s pitfalls, negatives and cons. Of course it’ll be easier if everything in Ralphs cost the same price, but I doubt people will buy more sticks of Wrigley’s gum for $3.00 when one could buy dozen eggs for the same $3.00 price. Surely you don’t expect everyone to be paying $3.00 regardless whether you buy one gallon of milk or ten gallons of milk either. Almost every US city that has implemented flat rate fares make no revenue, including NYC, the supposedly best we have in the US. Every city in other countries that has implemented distance based fares have much better farebox recovery ratio, some of which actually makes more than 100%, which is key to your financials. If the end result is that everyone isn’t going to be happy and that fare hikes will always be on the radar, a solution must be found. This isn’t something where “everyone else is doing it, so we should do the same” or “but it’s SOOOO COMPLICATED.” We’re not paying you guys to do that. We’re paying you guys to come up with solutions to problems that’s guaranteed to happen. Don’t fool yourself or ourself that you aren’t thinking about the next fare hike. We all know that so no use trying to hide it. If a fare system happened to be a range somewhere between $0.50 and $3.00 depending on how far one goes and all that it takes to do that for the consumer is to remember to TAP out when getting off the bus or getting out of the exit gate, then people will ultimately choose that over everyone paying $3.00. Implement a cap system in conjunction if need be so people won’t pay over a certain amount per day, week or month. I think many people will say that’s a fair solution: distance based fares with a cap system. After all, we aren’t a Communist nation. What’s the point of paying of everyone all paying the same price, when it’s clear that some people (people who have farther trips) do have to pay more than others? Flat rate fares look equal on the outside, but inside all it does is make people who have shorter trips pay and subsidize the rides of others who have farther trips. And it becomes increasingly so everytime fare hikes are done. Ultimately, the flat rate system isn’t really that effective in gaining more transit riders. Will still people ride Metro even at $3.00? Someone like James Lampert who constantly comes here saying he lives in OC and loves to come to DTLA venues who’s able to make a 40+ mile trip for $3.00, sure, it’ll still be a great deal for him. But for someone living in Koreatown to get to Staples Center less than 4 miles for $3.00? I really don’t think so. If you want to do a fare hike to $3.00, go right ahead. People living in OC and have 40 miles to commute should pay $3.00. But not people who live in LA who have shorter trip needs. If you think everyone paying $3.00 is all about equality, it’s definitely not it. It’s anything but and as more fare hike happen, it start smelling like “separate but equal” Jim Crow laws. Everyone pays the same price, but some people (people who travel farther) are “more equal” than others. The more you keep assuming so, the more people will realize that this isn’t equal and it will definitely cause more problems on your end. You do not want to lose farebox recovery ratio; it’s the key to obtaining federal funding. You do not want liberal activist lawyers come knocking on your door filing lawsuits about discrimination. It seems like today, this argument is becoming more vocal and it isn’t something that’s going to go away. The topic will continue to come back up as more taxpayers, especially Millennials who are much more tech-savvy and open-minded toward different cultures, especially those who have used transit elsewhere in the world start using the Metro system in increasing numbers. I would think this isn’t something you guys would want to brush off as an idea anymore but instead, something you guys should having a serious discussion about in your meeting rooms and your boardrooms. A few misunderstandings on the distanced based fares arguments just keep coming up. 1. Distanced based fare systems have to raise their fares just as much as flat fare systems. Metrolink, which is distanced based, constantly raises their fares. Meanwhile, Metro did not raise their fares for many many years. 2. A distanced based system will cost a lot of money to implement. Only half of Metro rail stations even have fare gates. Different TVM’s would have to be acquired. Also, more TVMs would have to be required as people clogging up a TVM trying to figure out how much to pay for where they are going. More signage and explanation kiosks would need to be paid for to explain the system as no one will know how much a ride is. This will cost hundreds of millions of dollars. Where does that come from? 3. People seem to have some fantasy that if a distanced based system is implemented, there will be this giant reduction in fares. They ignore the fact that US distanced based systems like BART and Washington Metro actually have higher base fares than Metro. The response is that some Asian countries have relatively low cost distanced based fares, which completely ignores the huge differences in transportation policy between the US and oil poor Asian countries. Distanced based fares have their place, but they are not some panacea and they will certainly not be some money maker will something like a 25 cent base fare. Just not going to happen as much as one wishes it were true. One big problem Metro has is trying to run everything itself. Transport for London has been very successful at minimizing subsidies by having companies bid competitively for the right to run bus lines – whoever can deliver the contractually guaranteed service on the smallest subsidy wins. 3) Expand the TAP: Do you remember in Reality Bites (1994), how Winona Ryder’s character buys all this food at the gas station and has to explain to daddy why his gas card bill is $800 🙂 Expand TAP is fine. I think we gotta figure out some abuse since TAP is paid for by businesses as a benefit for commuting. Speaking of commuting, I think we are not discussing the importance of public transportation to reduce strain on the current infrastructure. If you remove free parking, more cars will get on the road to commute. Your goal is fine is you want to shore up revenue, but it misses the point of reducing gridlock. > Public transit isn’t for car drivers anyway. Public transit is for everyone. I drive a car and I take public transit. How dare you! Metro does a poor job in reducing gridlock under the current fare model where short distance trips are discouraged. Gridlock is mainly caused by short distance drivers; people who use the car to go to the supermarket, people who drive to the nearest movie theater, gridlock happens because there are too many cars on the road clogging up surface streets where cars go in and out of parking lots too often. People in LA do not drive that far. We’re actually #2 in the nation right behind NYC of all US cities where car drivers drive the LEAST amount of distance. Gridlock happens because everyone drives short distances. No one is going to pay $1.75 for the bus for short trips. You drive a car? Good for you. Roads and freeways are also paid for with taxpayer dollars. You want parking at Metro stations? Pay up when you want to park there. Or you could always move closer to a Metro station so you can just walk there instead. That will be the ultimate way of getting rid of cars on the road: you move closer within walking or biking distance to a Metro station. Even your own Forbes article distinguishes between local driving with long haul commuters. “The Riverside-San Bernardino area east of L.A. comes in 10th. Though with California’s high gasoline price of $4.27 per gallon, these folks have it almost as bad as those out in Raleigh-Durham.” I’m talking about surface streets but also freeways. The fewer cars we have on the road at any given time, the better off we all are. As posted by Steve Hymon, some have no choice but to ride public transit. This is a captive audience… If you want to get cars off the road, you need to get more ridership which come from those where public transit is an optional choice. Do you think people will continue to ride Metro and more ridership will increase no matter what the price of a bus ride will be, regardless of distance traveled? People in LA, especially the poor, are already making choices whether to ride the bus or use the money to buy lunch. Have you been to the last fare hike meeting at Metro HQ? That’s what the students and the poor were saying. How is that going to increase ridership? You’re assumptions are full of flaws. Imagine if bus fares goes up to $3.00, even $4.00. Those aren’t unrealistic numbers. Some cities in the US charges that much just to ride the bus. At three dollars per ride you too will start making the decision whether taking Metro is worth it for a certain distance you’re going to travel. If you’re going from LA to Disneyland using Line 460, $3.00 will still be a great deal. If you’re going with a family of four to Disneyland, then that becomes questionable. $3.00 x 4 x 2 for roundtrip will cost you and your family $24 just to ride Metro to Disneyland. You might be better off driving a car. And you’re definitely not going to pay $3.00 to go from Chatsworth to Pierce College. You and your family are definitely not going to be using Metro to go see the LA Kings game at Staples Center either depending on how close you live to that sports venue. You’re better off just driving the car instead and paying for parking at DTLA instead. Ridership levels cannot increase under the ever increasing flat rate system. And there is a limit to what people will pay for to ride the bus. People will choose to walk, bicycle, use a kickboard, skateboard, etc. over taking the bus. Ridership numbers will not increase as fares goes up. And fares will definitely go up. Push comes to shove, if not the car, if not the bus, there is a third alternative: we go back to becoming a third world country and everyone gets around using moped and scooters. Ever thought about that option? A moped costs less than $1000; it’s cheaper than one year’s worth of a Metro monthly pass. A moped gets 80-100 MPG that even with $4.00 per gallon and usually moped have only one gallon of tank, $4.00 will last you an entire week pending you travel 80-100 miles a week. Why pay $4.00 per ride on Metro when $4.00 will last you a week for 80-100 miles of travel per week on a scooter? Why pay over $1,200 a year in monthly passes when $1,000 gets you a brand new scooter? Insurance is about $150 a year. Maintenance is easy and cheap you just do them yourself watching Youtube videos. Why do you think scooters and mopeds are the primary method to get around in places like SE Asia? Guess what? Taipei has a lot of scooters. So clearly Taipei still manages to keep scooter traffic all the while maintaining a 119% farebox recovery ratio. So your argument that “more people ditch the car and turn to transit, Metro will be better off” doesn’t fly when Taipei has high use of scooters to get around, but oddly, Taipei MRT manages to make a profit. You go up to the San Francisco Bay Area, scooter shops actually advertise that the scooter is the best economic alternative compared to MUNI or the car. And that’s also beginning to creep into LA lifestyle too. Hang around any of the hipster areas; you’ll see many Vespas and Buddys scooters. Expand your thought process and you’ll find that everything you have been lead to believe is all false. Please no more comments from those who have previously commented. Thank you! Questionable. Many companies in the US are able to get into banking/financial sectors while operating their main mode of business as a loss leader. Discover started off as a financial subsidiary of Sears Roebuck. Discover/Novus wasn’t just accepted to purchase goods at Sears, it was accepted throughout many merchants across the US. Discover now has their own Checking and Savings account is worth more than Sears today. PayPal started off as a subsidiary of eBay. Today, PayPal is increasingly being accepted as a form of payment in the real world, not just eBay payments. PayPal is now going to split off from eBay and is about to IPO itself in the 2nd half of this year. Many airlines have their own frequent flyer miles system where people can earn miles and points, which can be exchanged for many goods and services like magazine subscriptions, buying Home Depot gift cards, converting to hotel points, in addition to free flights. Face it, it’s a no brainer that banking and financial sectors are more profitable than running public transit. You very well can hire business executives and banking professionals and get into the banking business yourself and use some of the profits to help fund and run Metro. Loss leader concept isn’t this strange thing anymore. People today are accepting than idea. Practically Google, Apple, and Microsoft all run that way; they are not just IT companies, they are also in the music industry, TV and video, film distribution (Google Play, iTunes) they’re in the cell phone and tablet manufacturing industry, they are also in the computer business. This isn’t the 1950s where people are against the idea of corporations and businesses expanding their enterprise. It’s the norm today. When people put cash value into TAP cards, that can essentially become an e-savings account. If it can become an e-savings account, then the money put into a TAP card is good as any debit card or Federal Reserve Note; it’s no different from PayPal, Google Wallet, or Apple Pay where people can load up cash into an e-account and the money stored in there can be used in thousands of merchants all across the US that accept PayPal, Google Wallet or Apple Pay. For every transaction done with a TAP card, you can collect 1% from the merchant that accept TAP as payment. We’re not asking you to become a credit card company. We’re not asking you to partner with VISA or MC like the botched attempt of the VISA ReadyCard which had poor rates that no one bought into it. People do read fine prints; no one is going pay $3.00 per month for the privilege of maintaining a TAP VISA/Ready Card. People aren’t stupid. All we want is for Metro to research the matter of people being able to put whatever amount of cash they want into their TAP cards (which is done today with the cash purse option) and we want the ability to have TAP to be fully used as a payment system not just for Metro, not just for municipal agencies, not for Metrolink (which is taking forever), but also to purchase goods and services throughout SoCal merchants. No fees period. People don’t like fees and yes, people do read fine prints. You can beta-test this idea with Famima! at Union Station. Famima! is a Japanese subsidiary of a convenience store in Japan called Family Mart and they have presence also in Korea and Taiwan as well. They are very aware of this concept as they accept Suica cards, T-Money Cards, and Easy Cards as payments for goods and services. 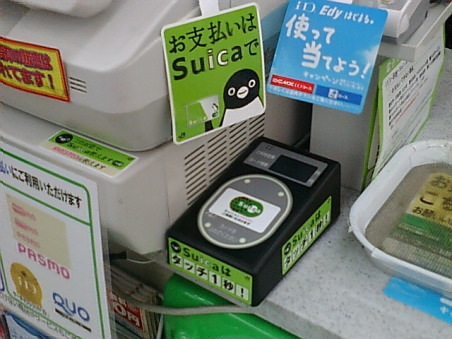 If Family Mart in Japan, Korea and Taiwan can accept Suica, T-Money and Easy Cards, Famima! in LA can very well start accepting TAP cards as payment.